Could anything be more exclusive and breath-taking than arriving at the Praia International Airport in the Cape Verde Islands by private jet? Soar over the clearest oceans, the cleanest sands and the lushest greenery, as you prepare to land in your heavenly destination. Cape Verde is an island country comprised of 10 volcanic islands in the central Atlantic Ocean, the islands span just 4,000 square kilometres. Be astounded by the intense beauty that greets you, with an eclectic mix of people and places. Sal is the most developed of all the Cape Verde Islands, with regards to tourism however, it remains relatively untouched. Although, Sal is the most developed, the other islands are just as accessible and absolutely worth a visit! Travelling between the islands is relatively straightforward, with the most popular method being flying; however the airline is not always reliable. A great alternative would be to take one of the regular ferries between São Vicente and Santo Antão, or between Fogo and Brava, as neither Santo Antão and Brava have airports! However, the more leisurely pace of this mode of transport will allow you to appreciate the beautiful turquoise waters and soaring volcanic islands. If you are enthusiastic about water sports, and live for the ocean, then Sal is the perfect island to visit. Due to its extensive sandy beaches and deep, turquoise waters, it is the ideal playground for water sports. It is one of the top five places in the world for windsurfing and there are numerous other facilities offering deep-sea fishing, diving and kite surfing. Nonetheless, if the relaxing lap of the waves and long beach-walks are more what you are looking for, Sal will not disappoint. Imagine some of the most exceptional beaches; with stretches of white, clean sands and sparkling sapphire waters. 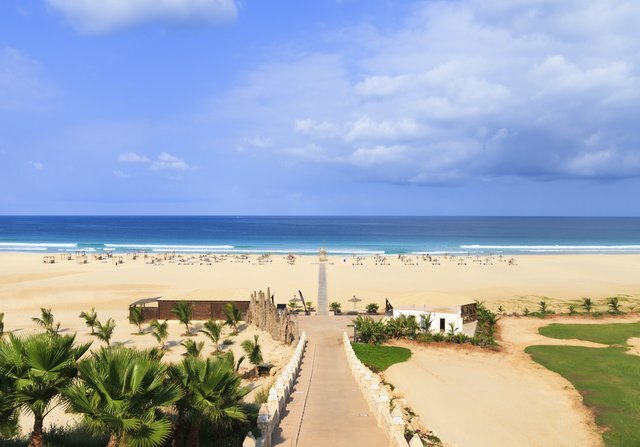 As well as the stunning beaches, rife with water sports, many people frequent Cape Verde due to the agreeable tropical heat, extended hours of sunshine and overall happy ambience that greets you. Sunshine makes for some true happiness. Cape Verde is known for its extensive and eclectic musical sounds, as music plays a huge part in the Cape Verdean culture. There is always a lively and flamboyant atmosphere that greets you at the festivals. One of the most popular festivals is Nossa Dra de Piedade (Our Lady of Pity), this takes place on 15th August and is comprised of processions, swimming competitions and local musicians performing on the beach. Experience some real Cape Verde sounds as you dance, relax or just soak up the ambience. Another, the Santa Maria Festival, takes place a little later on, on the 11th and 12th September. This festival is also on Municipality day, and is home to more music. This festival though, also offers many food and drink stalls, allowing you to not only hear, but taste Cape Verdean culture. These are both unique festivals, and are not to be missed. Are you dying to get your teeth in to some local produce, and be astounded by the variety of exotic and delicious tastes that are on offer? Head to Barracuda, a fish restaurant, with absolutely amazing food and fantastic service, you can’t go wrong here. Located at Front of Pier, Santa Maria, this inexpensive delight will satiate any fresh seafood cravings you may have. Another taste sensation offered by this stunning destination, is La Tortue, hotel Morabeza’s Cape Verdean buffet. La Tortue gives wonderful and diverse entertainment, and due to it’s popularity, must be booked ahead! Kick back and unwind as your belly is filled and your ears are soothed by the beautiful music.